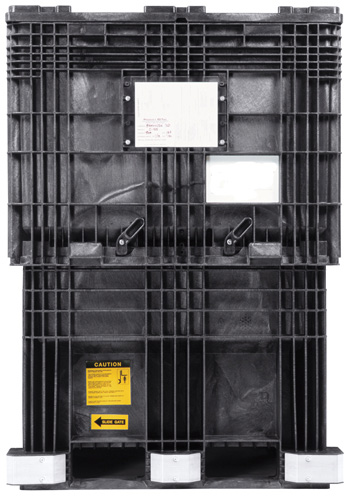 CenterFlow™ Bulk Containers are an efficient, versatile and reusable bulk container designed to transport and dispense product such as seeds, granular, pelletized materials, as well as small items and manufacturing components. It's smooth, funnel shaped interior has a 35 degree angle and center exit port which allows contents to flow safely and efficiently, emptying completely in as quickly as 30 seconds. Their unique design provides a safer work environment, saves time by not having to handle flexible bulk bags, while reducing packaging and disposal costs. Unit consists of base, removable ring and lid. 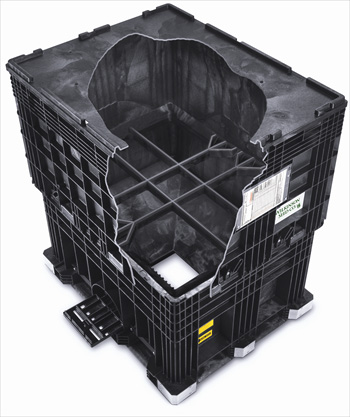 Made of structural foam molded HDPE which resists impact, moisture and most chemicals. Side access door allowing for flow control and access to contents. Removable ring is securely locked to base with latches. Help to evenly distribute the load is provided by strong, reinforcing crossbars. Guide lugs allow for easy stacking up to 4 high full. Solid oak base rails provide extra traction when handling with forklift tines. Reinforced feet with steel hit plates for added stacking strength and stability. Tight fitting lid provides protection to contents from contaminants. Temperature range of -20 degrees to +120 degrees F.
Clear plastic sleeves for identification tags. Will not rust, peel or splinter. 4-way forklift and pallet jack entry. Customization and identification options available. Heavy duty 2,500 lb. capacity for efficient material handling. Reusable option which lowers the cost per trip, allowing for a quick payback. Plastic bin is designed for safe, one person operation. The smooth interior allows for quick and complete discharge. Space saving as they will stack and nest for efficient storage and return shipment. When nested they take up 40% less space. Product protection against rodents and other contaminants. Strong, durable construction provides for long service life. Cost saving by eliminating waste and bag disposal costs. Always strap down when transporting. Do not stack anything on top of plastic bin except for another CenterFlow™. Equipment used to lift CenterFlow™ must be rated at a minimum of 3,500 lbs. Always use molded-in handles when assembling and nesting CenterFlow™. Always secure lids during transport. Dims. (L-W-H): 56.5" x 45 x 65"
Outside Dimensions - 56.5" x 45 x 65"
Tare Weight - 331 lbs.